Remember sentence diagrams? If you're like me—under 30 without a day spent in a Catholic school—the answer's probably no, but that doesn't mean you can't enjoy looking at them. 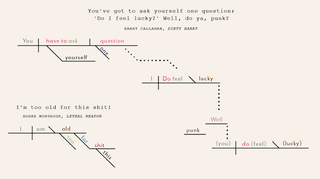 Luckily, Pop Chart Lab just released "A Diagrammatical Dissertation on Notable Lines of Cinematic Action," which breaks down the sentence constructions of some of the best lines in action movie history. The full graphic is below. Click here for a much larger version, or explore the print over on Pop Chart Lab's site.